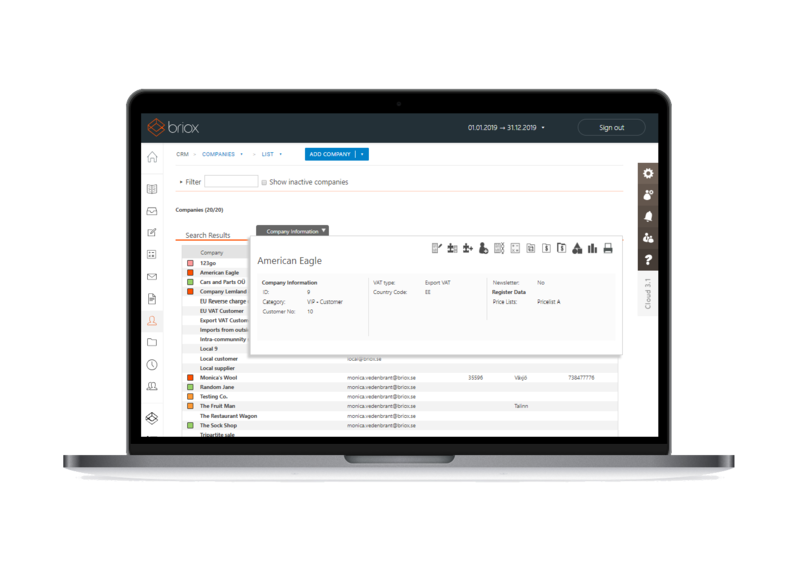 Briox CRM is a valuable tool for the modern sales organisation. Here you can easily handle your sales, marketing and other activities directly in your browser. You create, schedule and send targeted information via sms or e-mail. You can easily customise your company and contact cards, and choose what information you want to manage. For example, you can add custom search fields to suit your business. Together with Briox Order and Briox Invoicing, you create efficient management of the entire process from customer processing through quotation and ordering to invoicing. In Briox CRM it is easy to plan your time. Create task lists and choose when you want to be reminded. You can also schedule your mailings so they are dispatched exactly when you want. Select and target information so that the right person gets the right message regardless of whether it has to do with label printing for envelopes or newsletters via email, MMS or SMS. You can handle several of the functionalities from the program directly in your mobile or tablet. You can, for example, update contact and client information when you visit them. It is really easy to learn and use. At the same time it has all the functions that we need. Make your work easier by scheduling and sending personalised group SMS to your customers. With the add-on module Order, you can easily create quotes, order confirmations and delivery notes that are linked to each other and which can also be turned into to a customer invoice.